One benefit of my day job is that it constantly brings me into contact with folks from around the world, whether as colleagues or through business. One downside is that many of those who I’ve worked with eventually choose to go home. But my work being what it is, our paths may well cross again. And if I’ve done my job of boozy education properly, such meetings may well see my tonsils crossed with exotic liquor. Such was the case a few weeks back when a company “global summit” brought my Australian colleague and chum Tim back to Blighty with a brown paper bag full of micro brews from the land down under. As I’ll no doubt find out for myself when I return the favour and head to Melbourne and Sydney this autumn, it seems the Oz brewing scene has undergone a revival since I was last there in 1998. The choice of locally-made beers on offer, many by new wave micros, seems to have grown rapidly of late after shrinking noticeably in the early 2000s. A good thing when your domestic market is dominated by global giants. I can’t help thinking that returning Antipodeans have perhaps taken home something of the UK’s own love of quality beer (at least based on the brews presented to me) and replanted the seeds that have been largely dormant for so long. But there’s also no doubt that the entrepreneurial spirit so evident in American brewing has also percolated into the Australian beer renaissance, as it is now also doing in the UK (as evidenced by the coming of BrewDog and speciality beer bars and pubs such as The Euston Tap or the newly-opened Craft Beer Co) in Clerkenwell. Clearly Tim’s welcome gift wasn’t going to reveal the full extent of this renaissance but it was an interesting diversion from the norm nonetheless. None of the brews contained therein can be found on the UK market today so every bottle would reveal a bit more of the direction of Australia’s beer rennaissance as well as perhaps providing pointers as to what to expect from my own visit, when it comes around. As seems only logical in multi-beer tastings, the four Oz micros were imbibed in increasing order of alcoholic strength. Making a change from most samplings of US micros, that produced a range from 4.4% to 6%. Far more sensible for session drinking and perhaps an indication that Australian micros are as much concerned with the conviviality imparted by beer as they are with producing quality products. 1) Stone & Wood Pacific Ale (4.4%): Very light, a bit wheaty and rather simple but extremely crisp and rather pleasant, with good citrus-pine hoppiness from local variety Galaxy. Aftertaste is short and the flavour fades quickly. Still, a refreshing start, and colour-wise a bit of an aberration in this sample as it turned out. Scores points for being unfiltered, unpasteurised, hazy and dry hopped, although that, in a sense, only adds to a slight sense of disappointment over what could have been a more memorable experience. 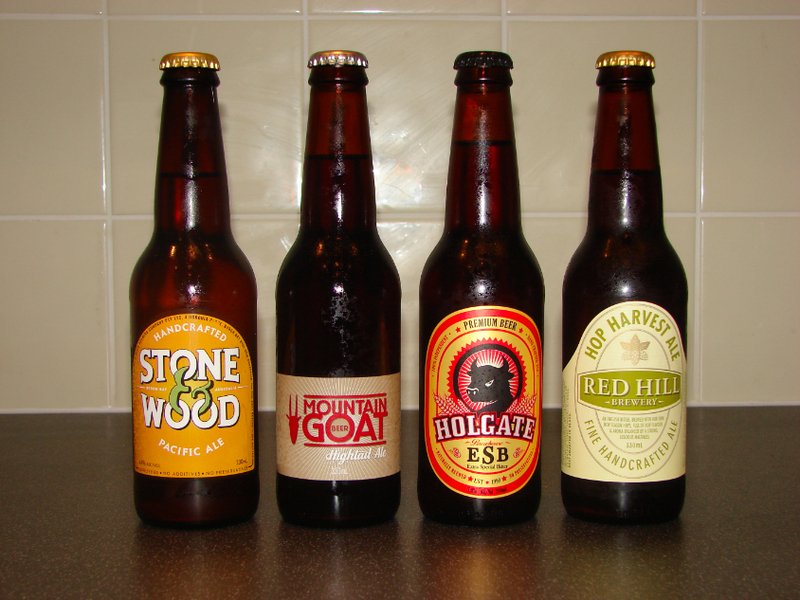 The Stone & Wood Brewery itself is in Byron Bay, in the extreme north of New South Wales. 2) Mountain Goat Hightail Ale (4.5%): Decent amber coloured ale of a kind increasingly common among UK brewers as well. Despite being described as “English inspired” it belongs more to the new school of spicy amber ales than it does that of classic bitters, even if it is more restrained than many (the 5% BrewDog 5am Saint I used as point of comparison, for instance). Its description as “fruity” by reviewers was certainly at odds with my expectations for that word many of who seem not that au fait with British cask beers. Mountain Goat Beer brews in Richmond, to the south east of the Melbourne’s central business district (or “CBD”), where it regularly opens the Goat Bar for parched throats. 3) Holgate ESB (5%): A dark amber/copper-coloured beer, Holgate ESB begins with a toffeeish nose and initially on the tongue. This quickly rounds out into a persistently hoppy (but not especially bitter) and slightly roasty brew more in the manner of a northern English brown ale than its namesake, the original Extra Special Bitter from London’s Fuller’s brewery. Bitters of this kind are rare at home nowadays, what with the current British obsession with “golden” ales, so Holgate deserves credit for taking the style closer to its roots. The use of the classically English Fuggles and Goldings also deserves note, although a few more of each may not have gone amiss to this tippler. 4) Red Hill Hop Harvest Ale (6%): Another deep copper beverage and the undoubted pick of the bunch, albeit not entirely unexpectedly due to its 6% alcohol. Boasting some excellent toasty and juicy crystal and chocolate malt flavours there’s a depth to Hop Harvest Ale that goes some way beyond the other beers in this selection, especially if allowed to warm in the glass a little. There’s also a sustained hoppiness from the Willamette and Goldings varieties that develops well as it goes down. Moreover, the beer lives up to its name without resorting to the overwhelming IBU (international bitterness units) scores that so define many US micros nowadays, although its 44 IBUs still provide a fair bit of heft. A very good beer I’ll be sure to seek out again on my travels. Red Hill Brewery and its on-site cafe are situated in Red Hill South across the bay from downtown Melbourne on the Mornington Peninsula.